Visual Studio Code>Other>bk-lookupNew to Visual Studio Code? Get it now. This extension is useful in invoking a browser to lookup a bug or issue in seen in code. You can configure the search string to correspond to whatever project you are working, and the appropriate url for your bug tracking system. Right-click on a bug number in your source. 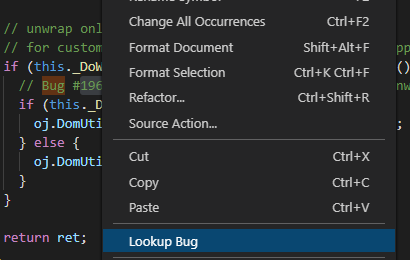 Select "Lookup Bug". A browser is brought up to your bug tracking system and show the related bug. If it's a JIRA issue, select the entire JIRA text (JIRA-123), right click, and it brings up the browser to your JIRA isue. There are 3 search bug engines installed: oracle, google, mozilla. The google and mozilla ones are publically available. The oracle one is internal only and default, so will not work for non-Oracle employees. You can select which to use by user setting json on top level: "bugdb.source": "oracle" or "google" or "mozilla" . If you want to user your own internal company db, you can set "oracleBugdb.url": "your internal url search". The oracle one also shows how to use 2 internal sites, if the selected string starts with JIRA, it invokes the JIRA oracle site, otherwise the bugdb site. For the oracle search engine, you must be inside oracle corporations network. For google and mozilla, no restrictions.